If my design is selected for final I can make some changes - adding QR code, photo or some other minor changes. 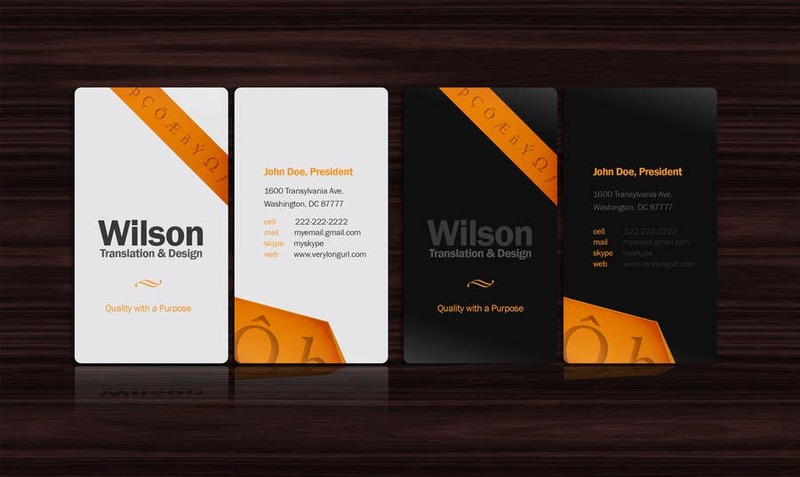 The format of the cards is standard 50 x 90 mm. Dark on light looks nicer. We would not want the dark one on the right. Of all of the entrees so far, there are only two that we like very much, yours and one other one. It is a very close call. In your design, where would you put the photo and the QR code? Can you mock that up? If you win, we may want to change the background color and possibly the characters chosen in the banner. I'm happy that you like my design. I would place the QR code/photo on the backside, either above the contact info or in the yellow detail at the bottom. Can't say for sure yet because it needs some experimentation, I send you a mockup in a moment. Changing the background color and characters if I win sounds all right to me. Yes I do web design, but only quite simple websites that not involves too advanced functions because I'm not a programmer. But I have good understanding of webdesign, experience with HTML, CSS and java script. I'm able to make themplates, split and adapt it for the web. I can make a website for you if you want, based on the same design of the business card.